By Aidan Coyle | December 7, 2018. On the 6th of July 2003 Roger Federer beat Mark Philippoussis to win Wimbledon and claim his first Grand Slam title. Since then men’s tennis has had a predictable ring to it. Of the last 55 Grand Slams, 47 have been won by either Federer, Rafael Nadal or Novak Djokovic. A number of younger players have threatened to break through but none of them have managed to stop the big three’s stranglehold on the game. Not that there have been too many complaints from tennis fans. They have enjoyed the brilliance of Djokovic, Nadal and of course the majestic Federer who have all graced the game with so many stunning performances down the years. However, there has been a curiosity to see if there was anyone who could step up and go toe to toe with the legends to make themselves the new man to beat. 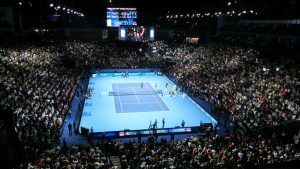 Alexander Zverev firmly announced himself as the player most likely to do just that when he blasted himself to the biggest win of his career over Djokovic at the ATP Finals. The 21 year old German dominated the match to beat the world number 1 in straight sets and follow on from his equally impressive semi-final victory over Federer. Zverev has been widely tipped to reach the top of the game for a while now. In 2016, he became the first teenager to beat Roger Federer since Andy Murray ten years previously. He then broke into the top 20 in the world, becoming the youngest player since Djokovic to do so. The only blight so far on Zverev’s impressive young career has been his inability to produce his best form in the Grand Slams. His best result in a slam to date was the quarter finals of this year’s French Open and even there he was soundly beaten in straight sets by Austrian clay court specialist Dominic Thiem. Zverev’s ATP Finals win is a great step for him but if he is to fulfill his potential then he will have to do it when it really counts. 2019 offers four more opportunities for him to break his duck but the pressure’s not going to get any easier until he finally manages that first slam. However, if his end of season form is anything to go on then next year might be Zverev’s time.